This is the Part 2 of the Microsoft Business Application Platform series. 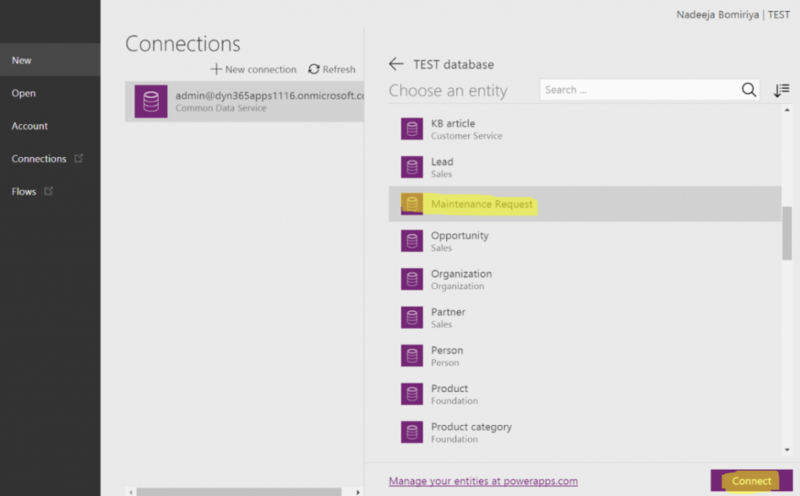 Part 1 – Microsoft Business Application Platform – Part 1 – Overview. In Part 1, I talked about problem and in this article I will discuss how we can solve the problem using PowerApps. 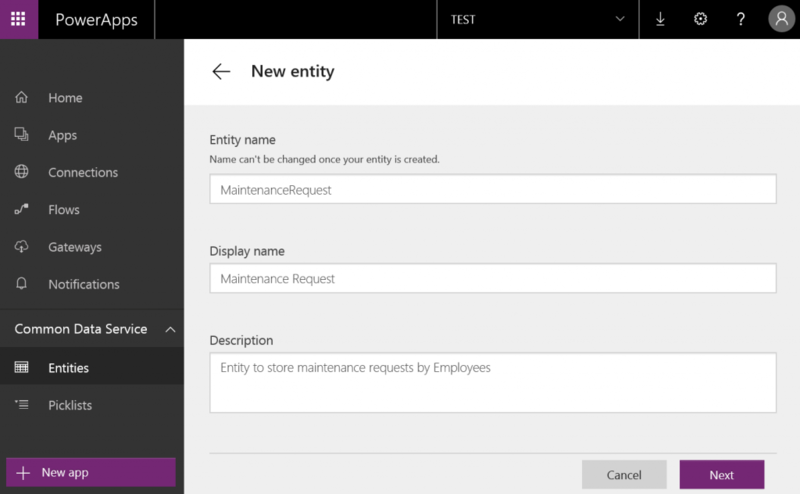 The latest version of PowerApps includes support for Environments. You can create different environments for your DEVELOPMENT, TEST, UAT, and PRODUCTION environments. Click on + New Environment button. 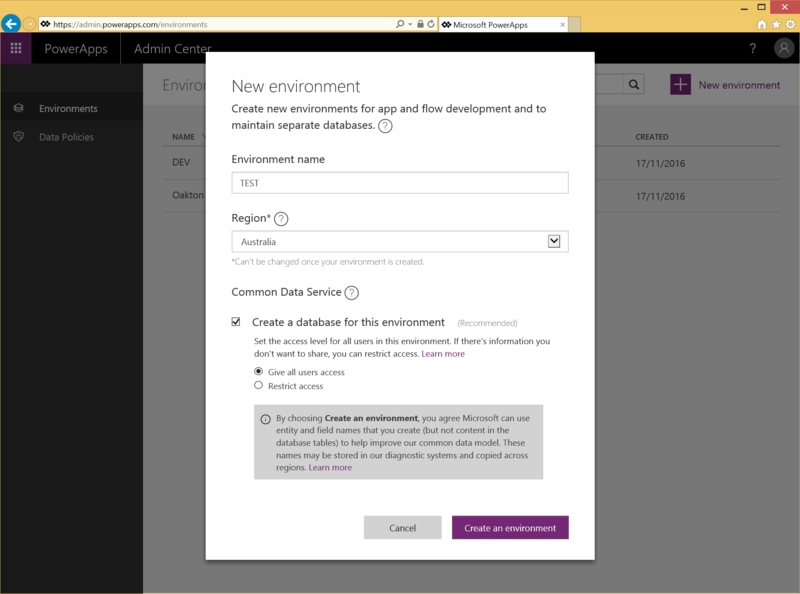 Enter a Name, select a Region, tick Create a database for this environment checkbox, select an access level, and click Create an environment button. Note: If you the Create a database for this environment checkbox untick the database for the Environment will not be created. But don’t worry, you can create this later. You can switch environment from the top menu. If your database in CDS is not created, you can create it as below. A database will be created based on the standard Common Data Model (CDM). Once the Entities are created, it’ll look like this. For our PowerApp, we could use one of the OOTB entities such as Case. But to demonstrate how to create a new entity and fields, I am going to use a custom entity. To create an Entity, click on + New Entity button. Populate the required fields and click Next. By default, 5 system fields will be created. Now we can create some new fields. Click on the newly created custom entity Maintenance Requests. Populate the Display Name, Title, and select a Type. Currently, below types are included. In this example, I have selected Text type. Click Save. Now that we have an entity to store data, let’s create a PowerApp. Click on the + New app button. You can create a PowerApp using two different tools. 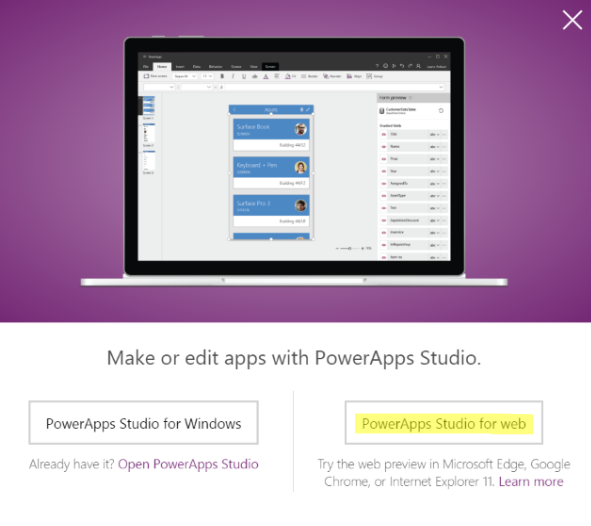 In this example, I am going to use PowerApps Studio for Web. 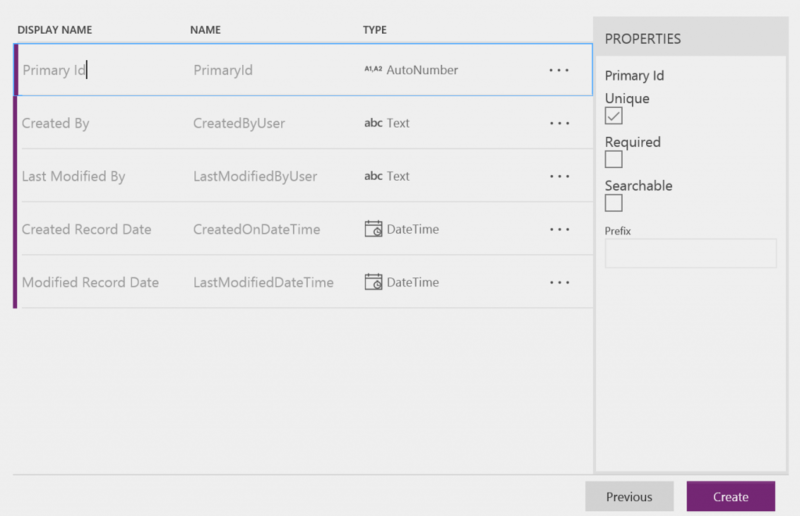 You can start creating a PowerApp multiple ways. You can start from scratch or from a data source. In this example, let’s start from Common Data Service data source. 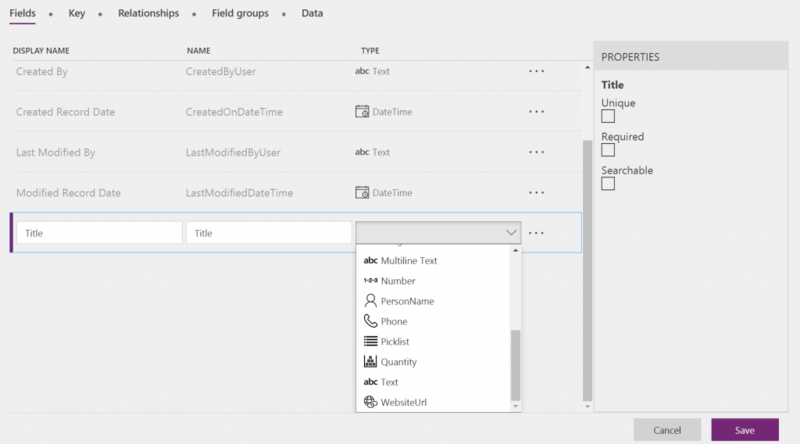 On the Common Data Service tile, click on the Phone Layout button. Select the Entity we just created and click Connect button. PowerApps Designer launches. 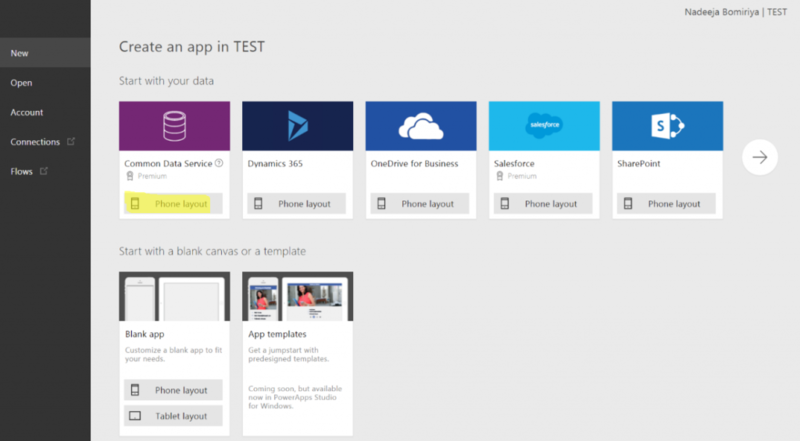 PowerApps will automatically build a 3 screen app for you. 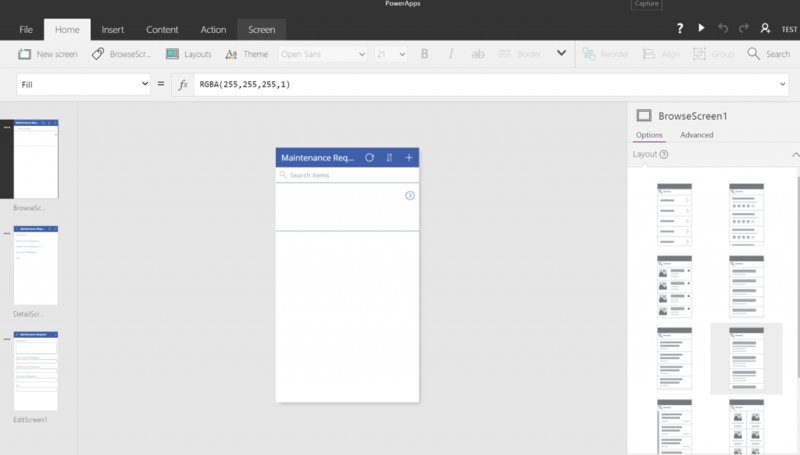 PowerApps Designer looks like a cross between Excel and PowerPoint. On the left hand pane, you can create screens. On the top there’s the Formula Bar. Left of the Formula Bar, you see the Property drop-down list which shows properties of the selected control. In the middle you have the Design workspace where you can design each screen. You can now test your PowerApp by clicking the PLAY button on the top right. You can create records, view lists of records, and edit records. So far, we haven’t written any code or even written any formulas. In Part 3 of the series, I’ll be customising this PowerApp with branded styles and more screens.